Hi my name is Roxanna! I graduated hygiene school over 20 years ago and have been a part of Dr. King’s team since then. I am a mother of 2 and I enjoy spending time with my 5 grandchildren and my 2 spoiled rotten fur babies. I love to craft, bake, and attend all of my grandkids sporting events! I am excited to meet each and every one of my patients! Hi my name is Laura; I have been blessed to work with Dr. King for over 7 years now. I graduated from WKU with a bachelor of science in Dental Hygiene in 2011. I have a wonderful husband and 2 beautiful daughters. I enjoy being outdoors with my girls, and watching UK basketball! I am very passionate about my profession and look forward to meeting you. Hi my name is Mariah; I have worked with Dr. King since 2015. She has personally trained me in all aspects of dental assisting. I work chairside with her to provide a comfortable, exceptional experience for all of our patients. Outside of dentistry my enjoyment lies in watching college and pro football, being around my friends and family, and taking care of my 2 cats. Hi my name is Dana! 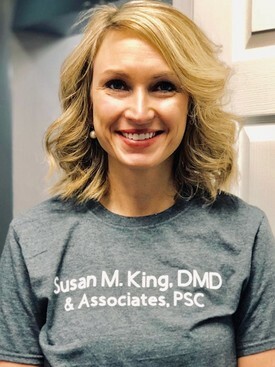 I joined Dr. Kings practice in October of 2017. 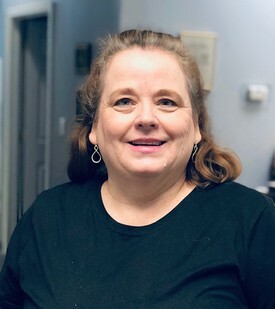 I have over 25 years of dental experience and have worked in all aspects of dentistry (dental implants and restorations, oral surgery and periodontal procedures.) I can confidently help patients navigate their dental insurance plans and how best to afford their dental care. My hobbies include gardening, swimming, biking and traveling, I also enjoy spending time with my 3 children and one special grandson Isiah! Hi! My name is Jasmine! I am the newest member of our dental team. I have a bachelors in science from the University of Kentucky and recently received my certification as an Expanded Duties Dental Assistant. I have been blessed with great mentors and training, and I am excited to keep learning more about dentistry! When I am not working I enjoy the company of my family. I recently got engaged and have 2 young children! I am always excited to try something new and see what life has in store for me!